There are a whole labyrinth of social media tools on the web which range from the useless to the actually-quite-useful. Here are five tools I use on a weekly basis as a freelance community manager which will save you time, help you create better content and generally just make your life easier. Whilst I often relish the challenge of cramming a funny and engaging tweet into 140 characters or less, there are times which simply demand the space for more words. Which is where Tweenjoy comes in handy. With Tweenjoy, you can simply type out your entire post, customise the colour & format, hit 'preview' et voilà! It creates a ready made image for you to add to your tweet, containing a full-length post with up to 1000 characters. It's a quick and super easy way of cramming as much info into one tweet as you can, and looks a heck of a lot better than sharing a screenshot of the 'Notes' app on your phone. Though I think that goes without saying. SOMEONE has obviously never heard of Tweenjoy. And who charges their phone up when it's already at 100%? 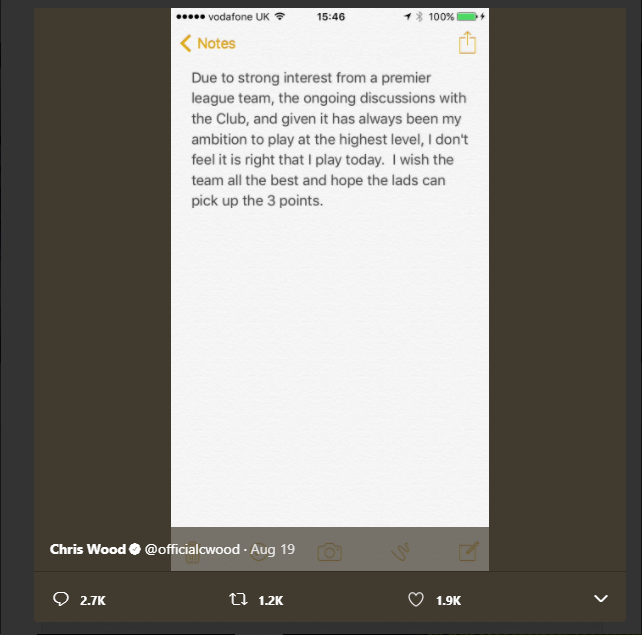 Premier League striker Chris Wood, there is so much I could teach you. If used in moderation, I find that an effective Twitter marketing tactic can be something as simple as following targeted users on the social network. That may mean, for example, my brand new (non-existent) live music venue following the followers of other popular venues in the city. That means people who could well be interested in your venture getting a notification directly from you; which isn't a bad thing in my book. But that also sounds boring and quite time-consuming, right? Well, it doesn't have to be! With ManageFlitter, you can easily discover relevant accounts to follow via a range of filters, whilst also using the same tool to unfollow any inactive or spam accounts you may accidentally be following. It's a great way of tidying up your Twitter account in a quick and efficient way, whilst also gaining tonnes of new relevant followers for free. Working as a freelance community manager means I have to be as efficient with my time as possible, which is why I'm a huge fan of Visme. It's a free tool which allows you to customise a host of different infographic templates to suit the information you want to convey, meaning you can put together a killer infographic in less than an hour rather than spending weeks agonising over one. The cool thing about Visme is the level of customisation you can achieve on it - meaning your end product looks original and not a cookie-cutter version of an infographic. Everybody knows that finding generic stock images of serious-looking businessmen is a key component of social media marketing...well not quite, but finding a nice image to accompany your post remains a very important way of grabbing your reader's attention in a crowded timeline - particularly when you're up against cute cats, dancing dogs and The Lad Bible. Fortunately, Pixabay is your friend. It has an extensive (1m+) catalogue of free stock images that you can use to you heart's content, which is mega useful for tight-fisted social media freelancers like m-....erm, someone that I know. Yep. There are better stock images than this on Pixabay. Much better. Quizzes are a great way of engaging your followers with fun and interesting content, and they don't require teams of graphic designers, copywriters and quizmasters to put together. There are, as ever, millions of free quiz makers out there, but my personal favourite (having gone through all of them, honest) is Qzzr. The cool thing about Qzzr is that you can actually make your quizzes look rather attractive, which is an important factor in that all-important battle for attention in a crowded news feed. Their quizzes are fully customisable, can be embedded on your own website or blog and feature some useful statistics on quiz completion rates and all that jazz. Here's one I made earlier. Community management needn't be so time-consuming. Using tools such as these means you can still produce high-quality, engaging content without whiling away precious hours of your time. Whilst it's often worth putting the hours in to produce quality content, I know that for a lot of people it's simply not possible to do that. Hopefully you'll find these tools useful. If you need somebody to put these measures into practice for you, get in touch today to see how I can help!